Editor’s Note: This is a republished blog post with an introduction by Jeff Ellis. The LA Times and other publications have followed up with articles based on that statement. Temblor is a mobile-friendly web app recently developed to inform homeowners of the likelihood of seismic shaking and damage based on their location and home construction. The app’s creators also offer a blog that provides insights into earthquakes and have writtene a post titled “Is the San Andreas ‘locked, loaded, and ready to go’?” This blog post delves a bit deeper to ascertain whether the San Andreas may indeed be poised for the “next great quake” and is certainly a compelling read. Drop, cover and hold on! Volkan and I presented and exhibited Temblor at the National Earthquake Conference in Long Beach last week. 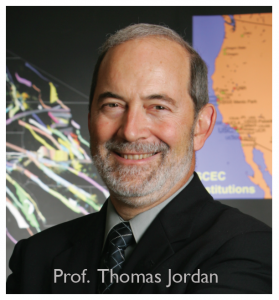 Prof. Thomas Jordan, USC University Professor, William M. Keck Foundation Chair in Geological Sciences, and Director of the Southern California Earthquake Center (SCEC), gave the keynote address. Tom has not only led SCEC through fifteen years of sustained growth and achievement, but he’s also launched countless initiatives critical to earthquake science, such as the Uniform California Earthquake Rupture Forecasts (UCERF), and the international Collaboratory for Scientific Earthquake Predictability (CSEP), a rigorous independent protocol for testing earthquake forecasts and prediction hypotheses. In his speech, Tom argued that to understand the full range and likelihood of future earthquakes and their associated shaking, we must make thousands if not millions of 3D simulations. To do this we need to use the next generation of super-computers—because the current generation is too slow! The shaking can be dramatically amplified in sedimentary basins and when seismic waves bounce off deep layers, features absent or muted in current methods. This matters, because these probabilistic hazard assessments form the basis for building construction codes, mandatory retrofit ordinances, and quake insurance premiums. The recent Uniform California Earthquake Rupture Forecast Ver. 3 (Field et al., 2014) makes some strides in this direction. And coming on strong are earthquake simulators such as RSQsim (Dieterich and Richards-Dinger, 2010) that generate thousands of ruptures from a set of physical laws rather than assumed slip and rupture propagation. Equally important are CyberShake models (Graves et al., 2011) of individual scenario earthquakes with realistic basins and layers. Tom closed by making the argument that the San Andreas is, in his words, “locked, loaded, and ready to go.” That got our attention. And he made this case by showing one slide. Here it is, photographed by the LA Times and included in a Times article by Rong-Gong Lin II that quickly went viral. Believe it or not, Tom was not suggesting there is a gun pointed at our heads. ’Locked’ in seismic parlance means a fault is not freely slipping; ‘loaded’ means that sufficient stress has been reached to overcome the friction that keeps it locked. Tom argued that the San Andreas system accommodates 50 mm/yr (2 in/yr) of plate motion, and so with about 5 m (16 ft) of average slip in great quakes, the fault should produce about one such event a century. Despite that, the time since the last great quake (“open intervals” in the slide) along the 1,000 km-long (600 mi) fault are all longer, and one is three times longer. This is what he means by “ready to go.” Of course, a Mw=7.7 San Andreas event did strike a little over a century ago in 1906, but Tom seemed to be arguing that we should get one quake per century along every section, or at least on the San Andreas. Now, if things were so obvious, we wouldn’t need supercomputers to forecast quakes. In a sense, Tom’s wake-up call contradicted—or at least short-circuited—the case he so eloquently made in the body of his talk for building a vast inventory of plausible quakes in order to divine the future. But putting that aside, is he right about the San Andreas being ready to go? The San Andreas (blue) is only the most prominent element of the 350 km (200 mi) wide plate boundary. Because ruptures do not repeat—either in their slip or their inter-event time—it’s essential to emphasize that these assessments are crude. Further, the uncertainties shown here reflect only the variation in slip rate along the fault. The rates are from Parsons et al. (2014), the 1857 and 1906 average slip are from Sieh (1978) and Song et al. (2008) respectively. The 1812 slip is a model by Lozos (2016), and the 1690 slip is simply a default estimate. When I repeat Tom’s assessment in the accompanying map and table, I get a more nuanced answer. Even though the time since the last great quake along the southernmost San Andreas is longest, the slip rate there is lowest, and so this section may or may not have accumulated sufficient stress to rupture. And if it were ready to go, why didn’t it rupture in 2010, when the surface waves of the Mw=7.2 El Major-Cucapah quake just across the Mexican border enveloped and jostled that section? 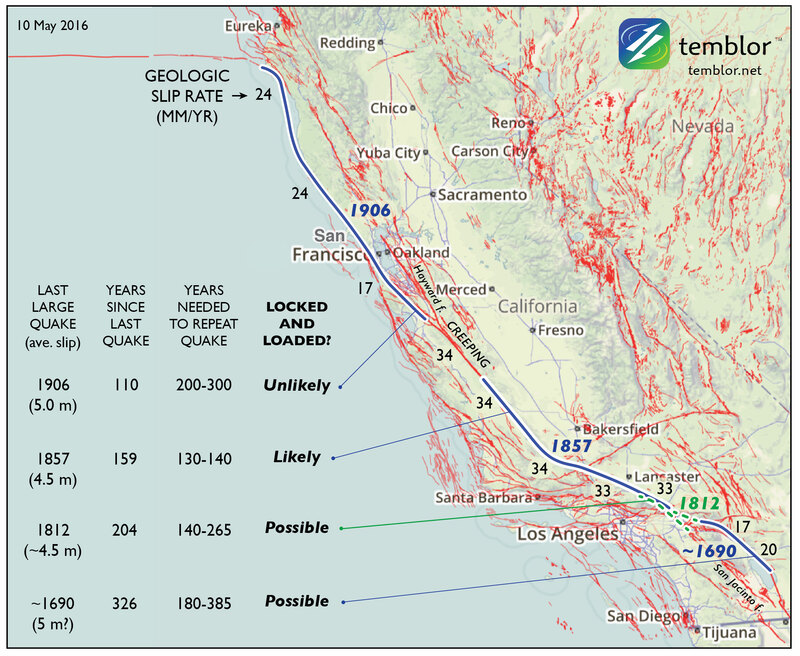 The strongest case can be made for a large quake overlapping the site of the Great 1857 Mw=7.8 Ft. Teton quake, largely because of the uniformly high San Andreas slip rate there. But this section undergoes a 40° bend (near the ‘1857’ in the map), which means that the stresses cannot be everywhere optimally aligned for failure: it is “locked” not just by friction but by geometry. Sometimes simplicity is a tantalizing mirage, so it’s useful to look at the San Andreas’ twin sister in Turkey: the North Anatolian fault. Both right-lateral faults have about the same slip rate, length, straightness, and range of quake sizes; they both even have a creeping section near their midpoint. 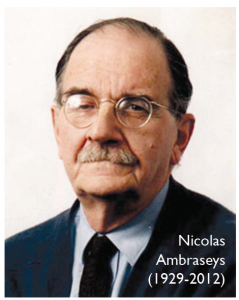 But the masterful work of Nicolas Ambraseys, who devoured contemporary historical accounts along the spice and trade routes of Anatolia to glean the record of great quakes (Nick could read 14 languages!) affords us a much longer look than we have of the San Andreas. The idea that the duration of the open interval can foretell what will happen next loses its luster on the North Anatolian fault because it’s inter-event times, as well as the quake sizes and locations, are so variable. If this 50% variability applied to the San Andreas, no sections could be fairly described as ‘overdue’ today. Tom did not use this term, but others have. We should, then, reserve ‘overdue’ for an open interval more than twice the expected inter-event time. This figure of North Anatolian fault quakes is from Stein et al. 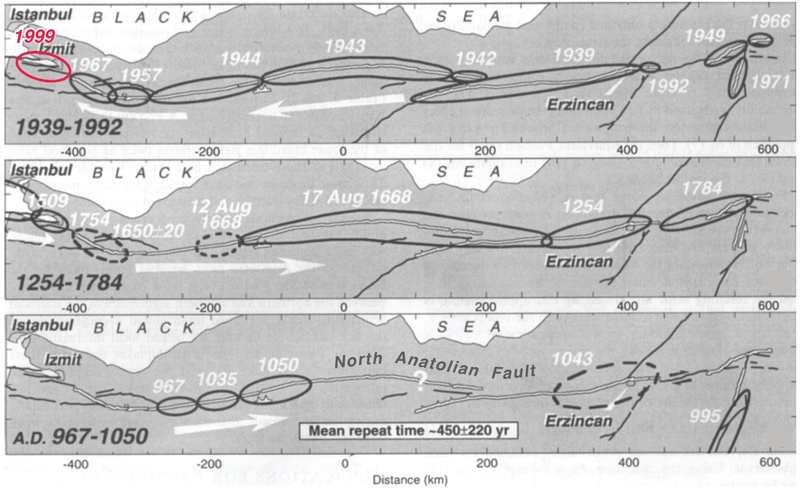 (1997), updated for the 1999 Mw=7.6 Izmit quake, with the white arrows giving the direction of cascading quakes. Even though 1939-1999 saw nearly the entire 1,000 km long fault rupture in a largely western falling-domino sequence, the earlier record is quite different. When we examined the inter-event times (the time between quakes at each point along the fault), we found it to be 450±220 years. Not only was the variation great—50% of the time between quakes—but the propagation direction was also variable. However, another San Andreas look-alike, the Alpine Fault in New Zealand, has a record of more regular earthquakes, with an inter-event variability of 33% for the past 24 prehistoric quakes (Berryman et al., 2012). But the Alpine fault is straighter and more isolated than the San Andreas and North Anatolian faults, and so earthquakes on adjacent faults do not add or subtract stress from it. And even though the 31 mm/yr slip rate on the southern Alpine Fault is similar to the San Andreas, the mean inter-event time on the Alpine is longer than any of the San Andreas’ open intervals: 330 years. So, while it’s fascinating that there is a ‘metronome fault’ out there, the Alpine is probably not a good guidepost for the San Andreas. If Tom’s slide is too simple, and mine is too equivocal, what’s the right answer? I believe the best available answer is furnished by the latest California rupture model, UCERF3. Rather than looking only at the four San Andreas events, the team created hundreds of thousands of physically plausible ruptures on all 2,000 or so known faults. They found that the mean time between Mw≥7.7 shocks in California is about 106 years (they report an annual frequency of 9.4 x 10^-3 in Table 13 of Field et al., 2014; Mw=7.7 is about the size of the 1906 quake; 1857 was probably a Mw=7.8, and 1812 was probably Mw=7.5). In fact, this 106-year interval might even be the origin of Tom’s ‘once per century’ expectation since he is a UCERF3 author. But these large events need not strike on the San Andreas, let alone on specific San Andreas sections, and there are a dozen faults capable of firing off quakes of this size in the state. While the probability is higher on the San Andreas than off, in 1872 we had a Mw=7.5-7.7 on the Owen’s Valley fault (Beanland and Clark, 1994). In the 200 years of historic records, the state has experienced up to three Mw≥7.7 events, in southern (1857) and eastern (1872), and northern (1906) California. This rate is consistent with, or perhaps even a little higher than, the long-term model average. While the southern San Andreas is a likely candidate for the next great quake, ‘overdue’ would be over-reach, and there are many other fault sections that could rupture. But since the mean time between Mw≥7.7 California shocks is about 106 years, and we are 110 years downstream from the last one, we should all be prepared—even if we cannot be forewarned. Sarah Beanland and Malcolm M. Clark (1994), The Owens Valley fault zone, eastern California, and surface faulting associated with the 1872 earthquake, U.S. Geol. Surv. Bulletin 1982, 29 p.
James H. Dietrich and Keith Richards-Dinger (2010), Earthquake recurrence in simulated fault systems, Pure Appl. Geophysics, 167, 1087-1104, DOI: 10.1007/s00024-010-0094-0. Edward H. (Ned) Field, R. J. Arrowsmith, G. P. Biasi, P. Bird, T. E. Dawson, K. R., Felzer, D. D. Jackson, J. M. Johnson, T. H. Jordan, C. Madden, et al.(2014). Uniform California earthquake rupture forecast, version 3 (UCERF3)—The time-independent model, Bull. Seismol. Soc. Am. 104, 1122–1180, doi: 10.1785/0120130164. Robert Graves, Thomas H. Jordan, Scott Callaghan, Ewa Deelman, Edward Field, Gideon Juve, Carl Kesselman, Philip Maechling, Gaurang Mehta, Kevin Milner, David Okaya, Patrick Small, Karan Vahi (2011), CyberShake: A Physics-Based Seismic Hazard Model for Southern California, Pure Appl. Geophysics, 168, 367-381, DOI: 10.1007/s00024-010-0161-6. Julian C. Lozos (2016), A case for historical joint rupture of the San Andreas and San Jacinto faults, Science Advances, 2, doi: 10.1126/sciadv.1500621. Tom Parsons, K. M. Johnson, P. Bird, J.M. Bormann, T.E. Dawson, E.H. Field, W.C. Hammond, T.A. Herring, R. McCarey, Z.-K. Shen, W.R. Thatcher, R.J. Weldon II, and Y. Zeng, Appendix C—Deformation models for UCERF3, USGS Open-File Rep. 2013–1165, 66 pp. Kerry E. Sieh (1978), Slip along the San Andreas fault associated with the great 1857 earthquake, Bull. Seismol. Soc. Am., 68, 1421-1448. Kids + Structural Engineering = The Tech Challenge! This week’s post comes from Marlou Rodriguez who is an R&D Engineer at our home office. Prior to joining Simpson Strong-Tie, Marlou worked as a consulting engineer. His experience includes commercial, multi-family residential, curtain wall systems and the design of seismic bracing for non-structural components. Marlou is a licensed professional Civil and Structural Engineer in California, and too many other states to list. He received his bachelor’s degree in Architectural Engineering from Cal Poly San Luis Obispo. Here is Marlou’s post. I recently had the amazing opportunity to volunteer as a judge at The Tech Museum of Innovation’s The Tech Challenge 2015 in San Jose, Calif. My role involved evaluating projects designed by teams of students in grades 4-12 whose challenge was to build an earthquake-safe structure. The museum’s annual Tech Challenge is a great event that excites young minds by introducing kids ages 8-18 to the science and engineering design process with a hands-on project based on solving a real-world problem. This year’s challenge was to build a scaled structure that supports live load and is earthquake safe. Simpson Strong-Tie was a sponsor of this year’s event and I was excited to be invited as a judge. While The Tech Challenge is always focused on solving a real-world problem, no one could have anticipated how real this one would become. On the first day, April 25, I woke up to the horrifying news that a 7.8 magnitude earthquake had devastated Nepal. Thousands of lives were affected by this devastating earthquake. On that morning, this terrible tragedy thousands of miles away really highlighted how important this design challenge really is. Perform with the least amount of drift or the horizontal movement at the top most part of the structure. As an engineer, I have spent 20 years designing structures to withstand earthquakes. But when I was in elementary school years ago, my thoughts were focused on which parking lot with new curbs, banks and rails or empty pools I could skateboard in. These kids are spending their weekends thinking of how to come up with a system to vertically support a high-rise building and ways to laterally support the building while dissipating the seismic energy induced by the testing rig. It was amazing to see the ideas the children had in their designs. There were structures with fixed bases, some with innovative base isolation systems and even a few with mass dampers attached to the top of the structure. The lateral systems chosen by the children consisted of moment frames, braced frames and solid core systems – closely resembling the systems used in most buildings today. Gravity weight of the structure could not exceed 7 lbs. In addition, there were some size and length limitations for the supporting materials, based on grade levels, and an additional live load was added to the structure by using bolts that were inserted into drilled holes. Not only did the teams have to adhere to the rules, but they also had to calculate the area of living space within their structure. All of these rules, calculations and how they overcame the challenges had to be documented in a detailed journal. A design from an elementary school team. One design that stuck out to me was developed by a team of elementary school children. I had the pleasure of conducting their pre-performance interview. They had a typical rectangular building with an interior compression member made of stacked plastic PVC pipes. The lateral system comprised of some tension wires that were attached to the top of the building at the interior PVC column. The tension wires were angled as they went through the floors and finally attached to the four corners at the base. The central PVC column bear on the base but was not directly attached to the base. This was a form of base isolation. The four tension wires attached to the four corners of the building were turned toward the central PVC column and attached via a spring. The spring acted as a way for the central column to return to its original position. The design was very interesting and had some innovative features built into it. I could only imagine how it would have performed in the device performance phase of the event, since I wasn’t able to observe that part. Structure designed by the elementary school team. Close up of the base isolation of the team’s structure. Earthquakes occur all over the world. These natural occurring events profoundly affect and change people’s lives. Although there are a lot of buildings that withstand earthquakes, there are still a lot of failures of existing buildings. Structural engineers learn from these failures and develop building codes and innovative products to resist future earthquakes. These future scientists, engineers and innovators that I had a pleasure of meeting are truly amazing kids. What struck me was how well these children were able to document their thought process and how they developed their final design. It makes me believe the future of this world is in great hands. I can’t wait to come back next year to judge another challenge. Thanks for reading our blog – have a nice holiday weekend! Author Marlou RodriguezPosted on July 2, 2015 Categories Academia, In the Coffer, S.E. Blog, SeismicTags Children, earthquakes, grade school, Innnovation, Seismic Engineering, Simpson Strong-Tie, tech challenge, The Tech Challenge, The Tech Museum of Innovation1 Comment on Kids + Structural Engineering = The Tech Challenge!